Sorry for not posting much of anything for such a long time guys, been quite busy as of late (see here if you're curious). Either way this post has been a long time waiting to be written as I actually got this a while back. I don't know if you remember me posting about anticipating something rather special in the post? Well this is what I sent off to a member of the Dreamcast Scene forums from Portugal..
...and here's what I got in return. 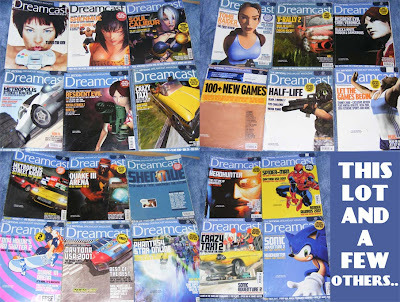 Yes, the guy who I did the trade with even went/goes by the name of Treamcaster online yet was looking to collect Dreamcast magazines and I just so happened to have a whole bunch of them from subscribing to it back in the day that were taking up a whole lot of room, so we did this rather neat trade! He even got on a webcam and showed me it working, which was awfully nice of him! I promised a Inside Out video of it and I still intend to do one when I've got time, but for now here's some photos. 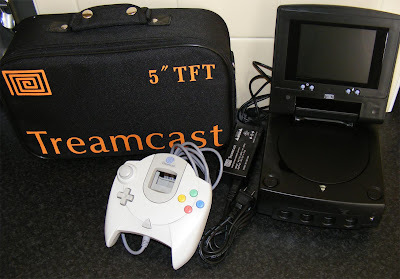 For those not in the know the Treamcast is a Hong Kong unofficial system (but made with official parts inside, so it's not a clone like all those NES and mega Drive ones you see) that is quite a bit smaller than the Dreamcast, is chipped to play any region of game but best of all has a fold out 5" screen and a headphone socket. It even even comes bundled with a car adaptor so you could take it about on the go if you really wanted. This is as far as i know the last of 3 models of this system made. 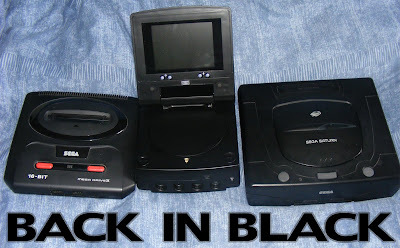 The first was white and apparently didn't have that great of a screen, then it was released with a widescreen, which to be honest looked a little silly as it stuck out on the sides, and finally there was this black model with a better screen. 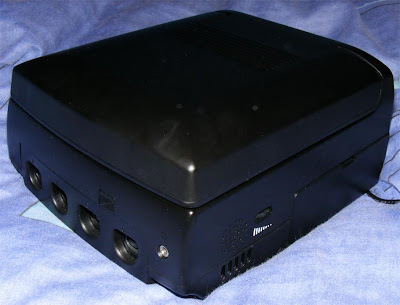 It even has the normal TV connections so you can hook it up just like a normal Dreamcast too. 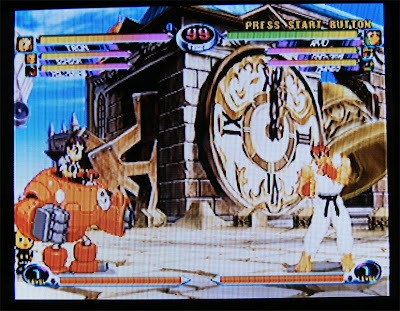 Here it is running good ol' Marvel vs Capcom 2. 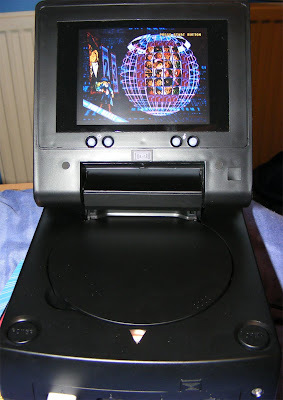 It's a fantastic piece of kit and while I seriously doubt Sega approved of it's existence (many a regular Dreamcast's must of been gutted to produce these) I'm sure it's probably quite the collectors piece too. There's something pretty neat about sitting sitting in bed with headphones on playing a bit of DC goodness in the middle of the night. UPDATE: Because barry asked for it. I have no sunglasses, so feel free to photoshop some in. Stick them in a Miami beach setting while you're at it. UPDATE 2: Barry, you are brilliant. I can't believe you got a Treamcast in return for a load of old mags! Anyone want to swap a few hundred old games mags for a Bugatti Veyron?! I'd love to see a shot of the Treamcast next to a Mega Drive and a black Saturn. With sunglasses on each console. And "Back in Black" superimposed over the image. (very quickly and crudely, mind). You won the internet today, my friend. Bahaha! That's perfect! The mega Drive button becoming eyes and the saturn's open button looking like a little smile makes it. He must have really wanted those magazines! Nice find. I nearly got this a few weeks ago. He's a nice guy. Welcome to the black Treamcast owners club :) (Treamcaster was the only other person I could find who owned one) I love my system, wouldn't sell it ever. Btw, what does the "T" in Treamcast stand for? Transportable? *sigh* The treamcast was the only thing that I ever had that you didn't Gagaman(n). And now you've got one. And it's better than my sucky old white one. Why God, WHY??? Oh, and why isn't the wonderful Barry part of the DCJY team yet? Have you seen the Nomad Junkyard??? It rocks! Thanks for the kind words about the Nomad Yard. I have big plans for it in 2010 (well, as big as you can get for a portable-focused blog). On a slightly Treamcast related note, can anyone tell me what this is for? It's made by Treamcast and looks like an ordinary mouse, but it has a working VMU socket and a creepy bear on it. I assume it's for the dreameye but I can't find anything about "dreamphoto". They claim there is 1 left in stock. I'd say it has the same purpose as the official DC mouse (which could be used for Worms, Rez, light gun games, FPSers and Internet) only with an extra VMU port (much like one of the controller adapters I have) which is actually quite handy if you want the keyboard and mouse in but not a controller. Treamcast also made a Saturn styled controller which came with the white Treamcast console, though that didn't have a VMU slot at all and was apparently of pretty poor build. So, any of you boys bidding on this? Barry: It has no software with it. Gagaman: It would be even more useful if you didn't have to switch between VMU and mouse modes using the little button on the side. Also, I think every piece of gadgetry should come with a "do not fiddle" warning on it.